In-place recovery works best when the partition/volume was just deleted, or the data and the file system on deleted/re-created/re-formatted partition have not been severely damaged (overwritten). In this case the recovery process is very fast, and you'll be able to access your files using Windows Explorer (or any other program) immediately after recovery. However, if some data overwriting occurred, or damage to the file system took place, Windows might not recognize the recovered volume (a drive with an assigned letter does not appear), or you may get messages like "Drive is not accessible". In this case you should try the second option: copy all existing data from the corrupted volume to a new physical disk. This approach is the safest way to get all your data backed up to a new safe place, however this is a slowest way. You keep your original damaged disk (all data on it not touched), and just copy all your valuable information to a dedicated attached HDD/SDD, external USB HDD or Flash Disk. Copy process itself could take a long time, especially in case if you have terabytes of data (videos or photo archives). In Active@ UNERASER, use QuickScan or SuperScan to detect deleted or damaged partition, verify its content and select the partition node. Recover Files & Folders only – copies all safe files and folders from the partition being recovered to a new target disk. Original data structure (location of files and directories in folder’s tree) and file’s attributes (creation date, read-only flag, etc..) have been duplicated as well. Advantage of this method is that copied files are guaranteed to be readable (accessible) on a new target. Disadvantage is that system areas, meta-data and deleted data are not copied, so future data recovery of damaged file system is not possible on a new target. Copy All Volume Data (sector by sector copy) – copies all occupied sectors on the volume as it is specified in file system’s allocation bitmap. This means than all system areas (like MFT records, or FAT tables) have been duplicated as well, and along with safe files and folders you can recover files being marked as deleted as well, so future data recovery is possible even from the new disk (target). This can be considered as a significant advantage. Disadvantage is that if some system areas (for example MFT, or boot sector) on the found partition are damaged, target disk will have exactly the same damaged data, and when accessing the new volume, or files on it, you can get error messages, like “access denied”. Select a designated disk (having enough storage space) to copy all you data to. List box displays all available disks in the system, excluding physical disks where operating system is installed. You can plug-in more disks (or remove some them) and the software should detect and display them here immediately. Make sure you select a proper target disk, as long as before copying occurs it will be formatted (all existing data, if any, will be lost). Click Unerase and wait while all volume data being copied. After completion Windows Explorer should be launched and you can access and inspect your data at the new location. Copy All Data to a New Disk command re-formats the target disk, destroying all data on it, before all data being copied to. Be careful and select a proper target disk, which doesn’t contain anything important! This approach is the fastest way to return your volume "back to life" in place where it was resided originally, however this could be dangerous and non-guaranteed way. Recovery of partition information, volume boot sector and partition table usually takes couple seconds, however you need to be absolutely sure that you recover a proper volume, and recovery is successful only when file system itself has not been damaged previously. This way works best when you just deleted a volume, realized the problem and immediately started recovery process. In this case not many data overwrite operations occurred within Windows environment, so most of your data structures are not being damaged. In case if you formatted the disk and installed a new OS, or copied some files to a newly formatted partition - you may still try this approach, however chances that some critical file system data structures has not been damaged are low, so most likely after recovery occurs Windows would not be able to access a logical disk and you will see something like: "Volume is not accessible or damaged" and "Do you want to format the volume? ", and you'll need to delete this invalid partition and try another approach. In Active@ UNERASER, use QuickScan or SuperScan to detect deleted partition, verify its content and select the deleted partition node. To mark a partition to be recovered as an Active , you may check the related check box. Be careful! If you mark as an Active a partition that does not have system files on it for the booting process - your computer might not boot properly. So mark it as an Active only when you sure 100% percent that partition being recovered had an Active status before deletion. After the recovery process is complete, a confirmation message pops up. Make sure that the results are correct by verifying the contents of the recovered partition in the Windows Explorer. Recovered partition should appear there after you refresh its content. If you've chosen Manual mode for the Boot Sector Check & Fix, dialog like above appears. Do NOT fix Boot Sectors - if both Boot Sectors look valid and match each other and the Boot Sector Template values. In the example above, even you are not a specialist - you can notice that Primary Boot Sector contains missed information (i.e. damaged), the red marks appear next to the fields, so the most appropriate action is to Duplicate Copy of a Boot Sector into a Primary Boot Sector. Unerase command for a deleted volume has been automatically logged to the partitioning backup file, and you can always rollback you changes later on. 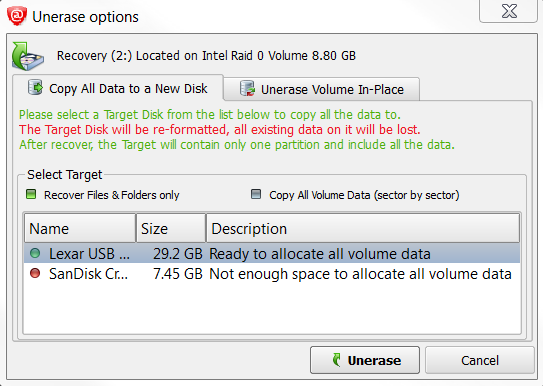 Unerase in place for a deleted partition function is available in commercial (purchased) version only.